We had a bit of time so we thought we would give the site a refresh. 2016 Exams are over. Time for a break - happy holidays all. This page was first added on 28/5/2011. We will try and keep a list of our newest additions to each page, to help you so look back regularly! It's lovely to get feedback and/or suggestions from our users. We have been really impressed with the number of people who want to contribute material so we have created a page for contributions. 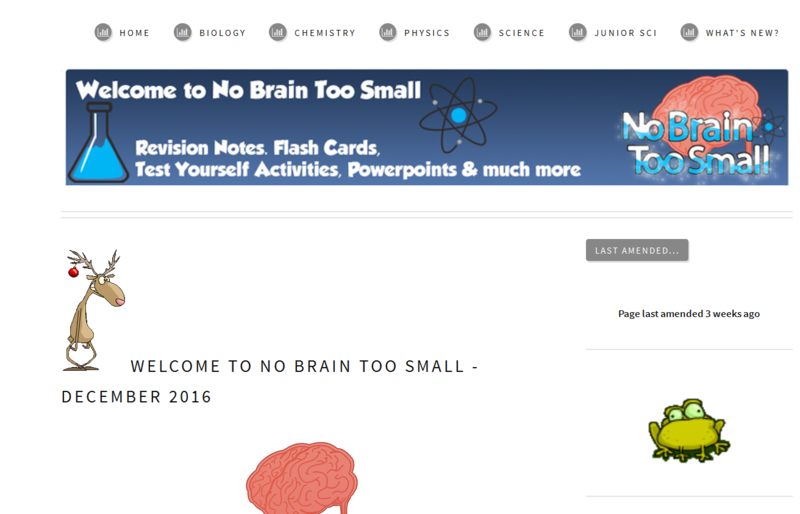 Access to this site is currently free - the team that run No Brain Too Small think it is important to actively support anyone who wants to learn about Science. This site has no sponsorship and is paid for personally by the team that run No Brain Too Small. The team that run No Brain Too Small reserve the right to change this model in the future. No Brain Too Small uses Adobe pdf as our preferred mechanism to share documents. If a pdf fails to open correctly, or fails to print correctly, you may need to download and install a newer version of Adobe pdf reader. Visit the Adobe site to download a free version of the latest version of Adobe reader. This site is adapted from ZeroFour, a free, responsive HTML5 site template by AJ for HTML5 UP.